Saturday, March 15, 2014, According to Bureau of Immigration (BI) all Filipinos who wish to go or travel abroad either as overseas Filipino workers (OFWs) or even as tourists are not required to show proof of financial capacity anymore before they are allowed to leave the country. If you wish to travel abroad, you only need to present your complete travel documents like; invitation letter where you will go as a tourist, your passport and other documents issued by a foreign country such as a tourist, and for OFWs they should have working visa before you will be allowed to leave. According to ABS-CBN news, BI chief Siegfred Mison said financial capacity is not a requisite before a citizen is allowed to enter or leave the country which can be a good news or bad news for everyone. This guidelines was implemented to contribute in declining the incidents of human trafficking and illegal recruitment because Philippines has recorded to have elevated to Tier 2 status in the US Department Trafficking in Persons (TIP) Report. BI is now only ask for documents on every Filipino going abroad as tourist such as; a two-way or round trip airplane ticket, passport, and a proof that he has a place to stay in the country where he intends to go (mostly an invitation from a friend or relatives). For immigrants, a complete documents requires by a certain country where they go will be asked. For OFWs, a working visa is a must offcourse and passport. As we all know or if you don't know yet, Bureau of Immigration is asking a show money upon the interview at the airport before you get the approval to leave the country as a tourist to a certain country on the day of your flight ever since. This requirement maybe was made to prevent people to go as tourist on a certain country but the real purpose is to find a work there even they only have tourist visa and be an alien on such country. 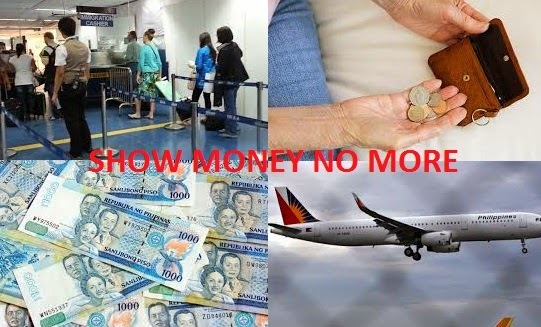 But, this news that BI will never as for financial capacity proofs for travelers abroad may have a risk of increasing Filipino alien on such country that accepts even a tourist to work on their county and soon will be given a working visa. We hope that this requirements by Bureau of Immigration (BI) will truly helps every travelers in and out of the country. Surely they still have precautions on some issues with no show money before any Filipinos can go out the country. Are you favor on this changes? Speak up your minds by posting comment below, thanks.